BIAFRA: IPOB SUNLIGHT ESTATE, UMUEBULE-ETCHE, HOLDS "GENOCIDE/EXHIBITION REFERENDUM AWARENESS LECTURE"
As the massive and steady evangelism outreach program of Indigenous People of Biafra (IPOB) ably led by Mazi Nnamdi Kanu, meticulously spreads across Biafraland in preparation for the upcoming Biafra referendum, the IPOB family - Zone 2, situated at Sunlight estate in Umuebule - Etche, Igweocha (Rivers State), held a Genocide Exhibition/Referendum Awareness Lecture for participants. The lecture which took place on Sunday 30th day of September 2018, was encouragingly successful. The exhibition awareness program displayed horrific pictorial excerpts and historical facts of the Biafra genocide. Present in the event were a cross section of Biafran elders, war veterans amongst others who respectively gave narratives on the genocide. One of the prominent traditional chiefs of Obigbo, chief Previous, gave concise analysis of how the Nigerian government was fully aided with weapons to carry out the atrocious genocide against Biafrans, triggering off the deaths of millions including starved women and children. According to him, the 3.5 million figures of Biafran deaths were totally under estimated. Members of the Biafra Indigenous Council of Elders (BICOE) present, jointly gave stories about the genocide stating that it was calculatively plotted to completely exterminate Biafrans from the surface of the earth. "It was a genocide, we had no other option than to resist it and that was why we picked up arms to defend our land and people. The Nigerian government yet systematically, committing another genocide in Biafraland. They are preparing in connivance with the British government to embark on another full scale genocide against us as a people". 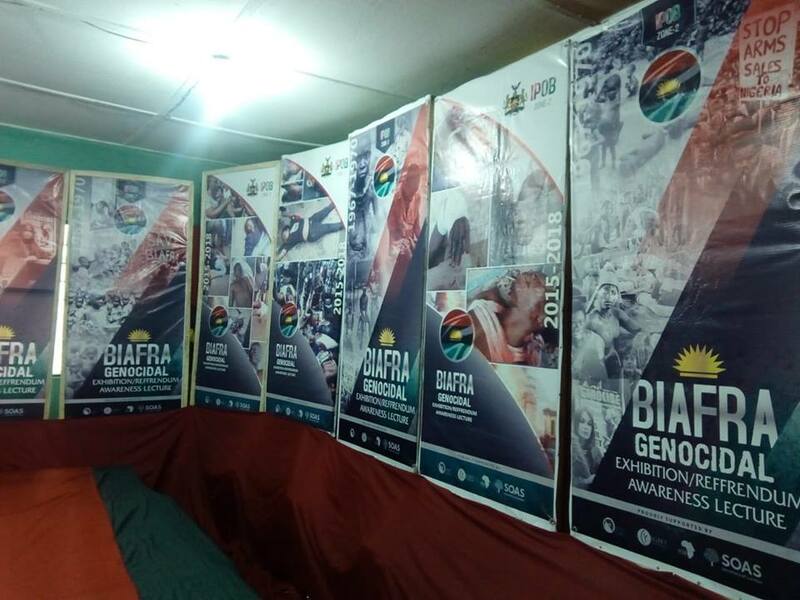 In an interview with the coordinator of the IPOB host family zone, Mazi Izuchukwu Agwu, he revealed that the exhibition was organized to fully educate our people on the hidden atrocities committed against Biafra population by the Nigerian government before, during and after the Biafra/Nigeria war.